Some people believe that if you let go of someone, in the spirit of love, he/she will come back and the relationship will be reborn, if it was meant to be. Meaning, if the one you let go does not return, then it wasn’t meant to be. I question the will, perseverance, and sincerity of those who rely on the “It wasn’t meant to be” statement, especially when it comes to a relationship. Check this out. There is also a saying that goes, “It is up to me— if it is meant to be”. See the difference in ownership, responsibility, take-charge, assertiveness and accountability of that statement? Big difference! This statement is more about having the aggression to make things happen. This is a power statement! Not some passive and pitiful approach to whatever blows that come your way. Some time ago, I was dating a Guy and found him to be consistently uncertain, doubtful even, and extremely slow to make decisions. He was slow about everything— even in handling business. I’ve learned when you are dating someone to observe their behaviors, how they handle their business, buildings they own, and finances they manage. Observe how they care, manage, respond, in business and their social life. The very same handling, responses, and behaviors will unfold in their relationship also. If you don’t like the way they handle their business, you will not like the way they handle the business in a relationship either. Now, some would argue that being slow to make decisions demonstrate great thought, consideration, and deliberate effort to make the best choice for the situation at hand. I would respond with, perhaps, they are just slow, have a blasé attitude and need to work with more of a sense of urgency. Perhaps it also denotes his/her insecurity and lack of self-confidence to make a damn decision! Just like his business, his responses in the relationship and about the relationship were slow and poor. He was poor in communicating; he lacked care and concern with matters of importance. He spoke in unknown parables and often times had to be led down a series of questions in order for me to begin to understand what he was trying to articulate. Ask him a yes or no question? Forget it! He would hmmm, and ahh. Yo! Very vague and annoying! All tell-tale signs of our failing future as a couple. He called me a couple of days later and told me, I let him go, because if it was meant to be, we would get back together. When I let someone go, trust me, I let go. I don’t let go to hold on. I don’t let go and hold on. I don’t play the game of hoping that letting go will generate a return. I don’t set myself up for unnecessary risks. I never relegate myself to being an emotional victim! Those days are long gone. I told him if God gave man dominion over the earth, surely man should be able to handle a relationship, and have dominion over his own actions and behaviors. I am a believer, if two people really put their minds to it, and make consistent efforts, together they can do anything. Hoping in the return of someone, after you have made the decision to let him/her go, is a set up for self-failure. Putting your hope in the hands of someone who you had to let go, is a definite steer onto the path of emotional destruction. There is always a slim possibility that Love letting go, can bring a return that was better than before. Anything is possible. However, not many people are making drastic and permanent changes that makes their come back worth taking them back. The phrase, “It was not meant to be” should be backed by hard work, utilizing every possibility, giving the best of yourself, and doing your finest work. Don’t just sit there and cite the words as a way out to not work hard for the relationship. Some folk actually say it, like it is out of their hands, using the phrase as a cop out. If you really observe them, they really put forth little effort, and then use an excuse of, “Well it was not meant to be”. Really, how weak is that??!!!! When you have exhausted everything and it falls flat? THEN the saying, “It was not meant to be” is valid, tried and true. Also there are no regrets (no wondering if) of what could have been, because you went through a process of trying to make things work. Tried every possible way to work things through. Then you will know beyond a shadow of a doubt, and without any need for future contemplation that it really wasn’t meant to be. So, should (when) that person tries to return, you have definitive information on what did or didn’t happen to cause you to let go in the first place. Chances are you will not be interested in going down the same path of the behaviors that caused you to let go in the first place. Trust me. When you are an outstanding partner and you make the call to let your partner go, more often than not, (99% of the time) they will want to return. In truth, we cannot control our partner. We have no control over whether he/she will be honorable, or bring their very best, love completely, and deport him/herself to make the relationship successful. We can only control what WE do, and we do have some say on what we will not take, and we can express by demonstration in our word, example, action and deeds, the quality and respect, we are so deserving of. So, before you say, “It wasn’t meant to be” make sure you were not the cause, because you were not doing your best “to make it be”. 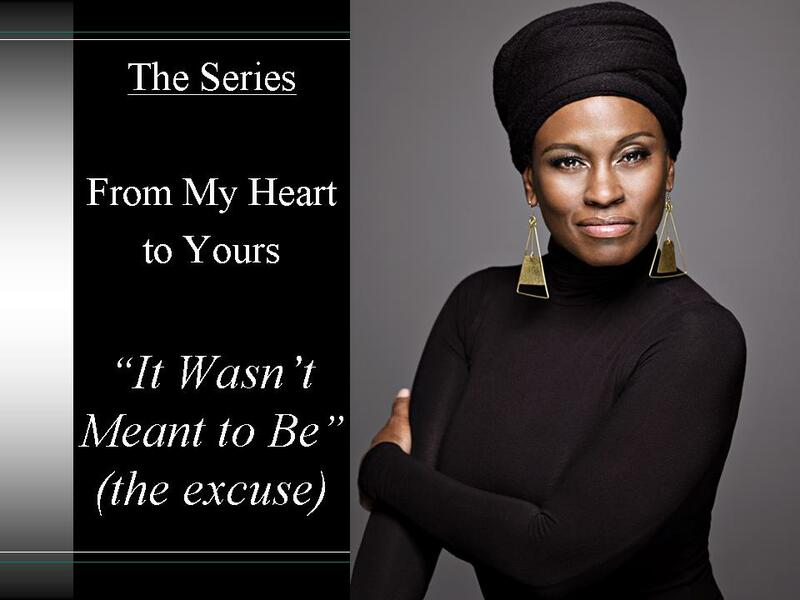 This entry was posted in Series from the Author-My Heart to Yours and tagged an excuse in the relationship, the relationship was not meant to be. Bookmark the permalink. My ex used this excuse to throw away a 20 year relationship. Our marriage died, our kids dismayed at the bottom of the bottle she couldn’t give up. We are all still hurting and I ache for what was and what should have been. Don’t know if I will ever recover. Seasons Greeting MJSolis. You may be well on your way now. But if not, yes, you can recover! I share your 20 year marriage as well. I HAD to move on. There is no other option and so it must be for you. Life is huge. Oftentimes, we get so comfortable with someone. Making him/her our world. When there is a world we’ve not begun to discover. We get so comfortable within the 4 walls of our heart, the person we are with, and in our homes, we forget that the dimensions are many. This makes our options many. Please go inside and heal. Know you are the best and know you will meet someone who will love just as hard as you. Yes. Your girlfriend is broken. Life has given her some pretty hard blows. It takes a lot of self-work in order to overcome what’s happen to her. Death is the ultimate formidable force to reckon with. It seems as though the death of her Father must have had some impact, because you may not have mentioned it. Not sure what her Father has taught her. To be in company of someone doing drugs, resulting in an overdose, means she has been exposed to drugs. How much exposure has she been as a partaker? It is difficult to be with someone, especially in a relationship and not join them. That is another angle that should be considered. And abuse, depending on what kind she’s experienced, is another monster entirely. Her “brokenness” will not allow her to let go of the past. In order to face the future, in the state she is in, she will need to look at her past, square in the eye, address it, emotionally deal with it, in order for it to let her go. It seems as though she has not reached that point in her life where she is ready to solve this. My question to you is where is she in your heart? How long have you been together? Is she worth you enduring her brokenness? How much time have you given her already? Was her only response to you is “It wasn’t meant to be?” The information you have given me appears to be everything about what is wrong. I wish you love and peace in your quest for life. Well it is very unfortunate for many of us good men that keep meeting low life pathetic loser women all the time especially the ones that like to Curse at us for No Reason at all after we say Good Morning Or Hello to them to start a conversation going. Quite a change in the women of today compared to the women of years ago which Most of them were the Best with a very Good Personality as well. Gee Wiz, this is a very Good Reason why many of us men are still Single today. Right? Right. Born at a very bad time for many of us unfortunately since we have No Reason at all to Blame ourselves. Thank you for reading. There are a lot of good available women saying the same thing. I myself am single. It is by choice. Knowing too much on how to have a successful relationship poses a couple of red flags. The men I’ve dated expects me to hold the relationship together while they sit in the cut watching me make things happen. Or one’s I.Q. on relationship success, (if you will) I’ve opted to simply wait. It would be great to bridge the gap here with good available women and good available men. If you have a blog, website, etc. I’d love to read what you have going on. Thank you for visiting!